Reasons for Visa Denial | Go For Visa | Australia Immigration Consultant & Visa Experts in India. 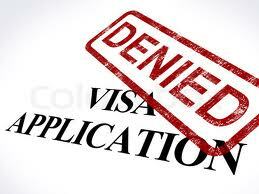 Most of the people often get upset when after a lengthy and tedious application process, there visa get rejected. Sometimes, people don’t know what steps to take in order to tackle the visa denial. What the common known fact is that an individual whose visa application has been rejected has to apply again. What it exactly means that he has to file another application form, sending one more set of necessary documents, paying an application fee which is non refundable and fix one more interview appointment with Consular Office. Reapplying is not a definite remedy for visa refusal. In case, you are victim of visa denial, don’t think that you can reapply by following similar procedure one more time. It is extremely essential to understand the exact reason behind your visa refusal and work on the remedy which fits your case. Don’t get persuaded by what opinion you hear from relatives or friends as every visa application is unique in itself. Section 212 (a) (9) (B) (i) - Overstaying. Section 212 (a) (6) (C) (i) - Misrepresentation of facts or involved in visa fraud. Section 212 (a) (4) - Inadequate evidence of financial support in US. Section 214 (b) - The application fail to overcome the presumption of being an intending immigrant to US. Section 221 (g) - Incomplete and erroneous visa application with lack of supporting documents.